Learn common English phrasal verbs with pick. Learning phrasal verbs in English will help improve your English reading, writing, listening and speaking skills. There are many phrasal verbs in English and sometimes learning them can seem very challenging, which is why we have made learning phrasal verbs easy! After you have learned some common phrasal verbs with pick you can download this free English lesson with exercises. Mauro picks at his food. He eats like a bird. If you have a mosquito bite, you shouldn’t pick at it. Toni picked the hairs off her sweater one by one. Teenagers always pick on the new kid in school. He picked up his book and left the room. I picked up a little Korean when I lived in Seoul. Miami Beach really picks up in March because of Spring Break. Larry always picks me up when I fly into Philadelphia. Please pick some milk up when you go to the store. Anastasia picked up our tab at the bar. Let’s finish this for the day and pick it up again tomorrow. I think she likes me. I am picking up a lot of signals. Roberto is very clever. He picks up on new grammar points easily. I told Gina to pick out a new pair of shoes for her birthday present. When the direct object is a pronoun, it must be placed in the middle of a two-word phrasal verb. Example: Larry picked her up. NOT: Larry picked up her. She picked me______ after my English class. Stop picking ______ him! Can’t you see he doesn’t like it? I had to pick the tomatoes ______ Scott’s burger. He doesn’t like tomatoes. I wish my girl friend would pick ______ the bill sometimes. Going out is really expensive. I don’t have service on my cell phone. I am not picking ______ any wifi signal. I am going to take you to buy a new pair of sunglasses for your birthday. You can pick ______ the ones you like. I’ll run down to the store to pick ______ some new batteries. Can you pick ______ your feet for a second. You are standing on my shoe lace. My daughter doesn’t eat much. She just picks ______ her food. I hope I pick ______ some new phrasal verbs from this free English lesson! The mother waited while her daughter ________________________ the toy that she wanted. I have to go run some errands, but I ________________________ you later tonight. My big brother always used to ________________________ me when I was a kid. Suzanne ________________________ the kids at a friend’s house after going out to dinner with her husband. Business really ________________________ after they advertised their products on television. Sign up for our newsletter or follow us on your favorite social network for all of our new free English lessons and articles. If you have any questions, please email me or even better just comment below. 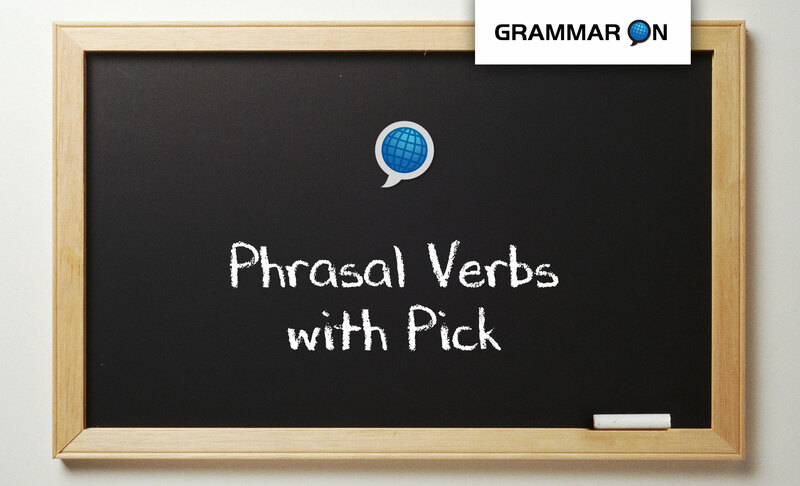 Remember, these are only some of the most common English phrasal verbs with pick. If you would like to add more phrasal verbs with pick to our list please let me know.